Skyfall is a 2012 thriller / action movie, Daniel Craig is playing a leading role as James Bond. Who is the famous character. 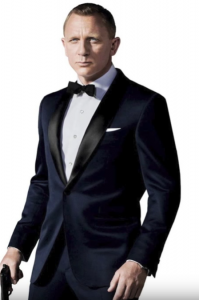 James Bond wore a stylish navy blue suit that is so famous too. This is a tuxedo having one front button closure with two waist and one chest pocket. Button style cuffs making it more attractive. James Bond watches and shoes also being collected by his fans. Now he is known as fashion icon.